"Juicy, warm chicken breasts baked in a crunchy pecan and garlic flavored coating sit on a bed of crisp romaine lettuce. Dried cranberries and mandarin oranges add a sweetness that is balanced by the tanginess of crumbled blue cheese. Ranch dressing ties the dish together to make a wonderfully light, filling salad." Place the creamy garlic dressing and pecans in separate bowls. Dip each chicken breast in the dressing then in the pecans to coat. Arrange chicken on a baking sheet. Bake chicken 25 minutes in the preheated oven, until juices run clear. Cool slightly, and cut into strips. 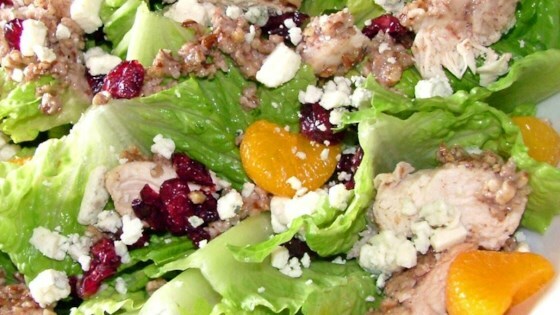 On serving plates, arrange equal amounts of the lettuce, mandarin oranges, cranberries, and blue cheese. Top with equal amounts chicken, and serve with Ranch dressing. Umm, 70 g. of fat is not a light salad. Great as a main dish on a hot summer day! I did not have creamy garlic dressing, so I used Ranch dressing to dip the chicken in before coating with the pecans, and that worked just fine.